Let’s be honest, winter has a way of making even the most picturesque towns look dreary and depressing. Like sad, Siberian outposts where women have to wear bikinis in the snow to try to lure people to visit. 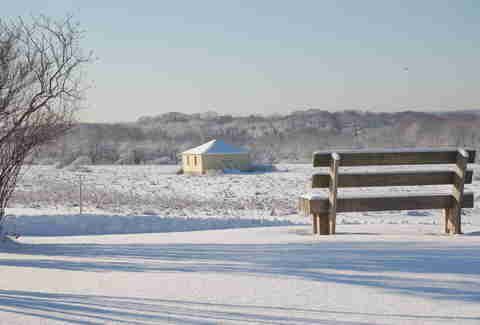 But not all winter towns are created equal. No, some spots find a way to look even better under grey skies and fresh snow, transforming themselves into magical winter wonderlands that the kids just won’t stop singing about. Seriously, please, stop the singing. Here are 10 of those towns. 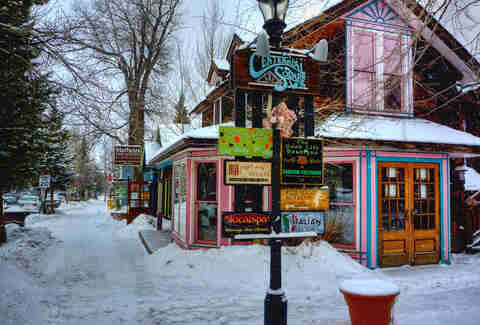 With 30% of the town's land set aside as undeveloped, open space, Breckenridge balances the role of quaint mountain town and bustling tourist haven pretty seamlessly. If all you do here is prowl the ski slopes, well, that's cool and all (we won't judge), but you'd be totally missing out on eye-catching winter attractions like the International Snow Sculpture Championships, the Norse-themed Ullr Fest, and Colorado's largest historic district covered in snow. Between picturesque attractions like the recreation path/X-country ski trail, the frozen Bingham Falls, and the Trapp Family Lodge (yes, as in The Sound of Music Von Trapps), Stowe's pretty much got the "beautiful Vermont winter" thing locked down. 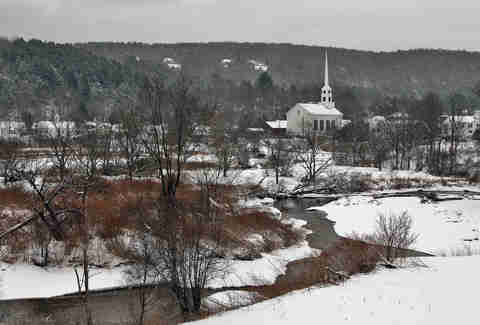 It's the quintessential New England town (with covered bridge and all), and it's gorgeous. Also, there's the ski resort. And the Ben and Jerry's factory down the road. 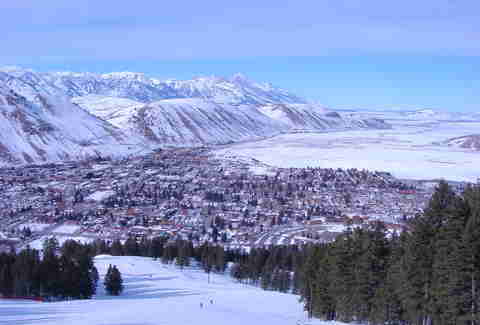 Not to be confused with Jackson Hole, the frosty town of Jackson acts as a gateway for the millions of tourists who pass through on their way to Yellowstone, Grand Teton National Park, or one of the nearby ski resorts. Four elk antler gateway arches serve as entrances to the town square, which you gotta admit is pretty cool. Tucked in a box canyon and bordered on three sides by 14,000ft peaks, this former mining camp's pretty much what you picture when you think of "mountain town." Telluride's renowned for the Victorian and Greek Revival architecture of its historic district, and since the famous Telluride Film Festival is already over by the time winter rolls around, there's nothing to distract you from having fun in the snow. 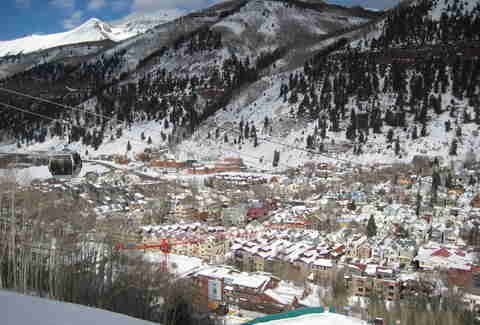 As a bonus, take the spectacular 13-minute gondola ride up to the neighboring Telluride Ski Resort. Kennebunkport gained notoriety as a haven for the moneyed elite in the late 19th century (the elder President Bush's got a well-known summertime haunt on Walker's Point), but this northeastern seaside town takes on a new look once the warm weather crowds retreat. The colorful buildings of Dock Square contrast with the fresh powder that blankets the town each year, and a drive down Ocean Avenue showcases many of the fabulously expensive homes that pepper the coast. 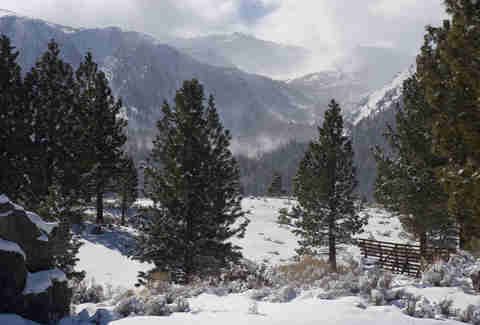 California's reputation for sunshine and warm weather is a given, but with an elevation of 8,000ft and an annual snowfall greater than Vail, CO, Mammoth Lakes is pretty much the polar opposite of the cliche. Its natural beauty is not all evergreen trees and pure white snow, though: there're also hot springs between the towns of Mammoth Lakes and Bridgeport, some of which (like Buckeye) are clothing-optional. 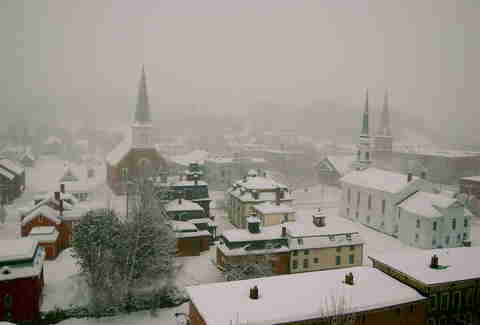 The smallest state capital in the entire country (it's like the Gary Coleman of administrative centers), Montpelier looks like the snow-covered town you'd build for your model train set -- if, you know, you were into that kinda thing. Which you're not, of course, but if you were. By the way, it's also the only state capital without a McDonalds -- just a random fun fact you should know when you're totally not building a model of the town in your basement. 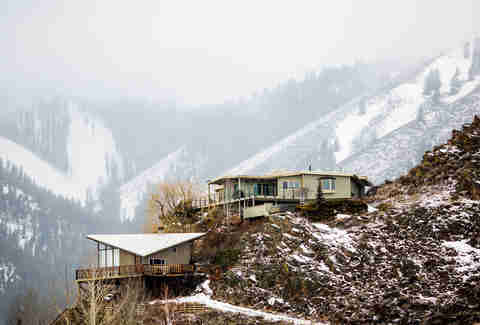 Tucked away in Heber Valley and bordered on its western side by the iconic Wasatch Mountains, Midway's already a looker from the jump. 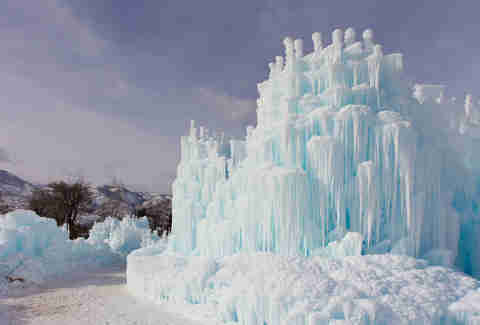 That said, its most striking winter feature's definitely the Ice Castles: massive artistic structures, handmade each year from nearly 20 million pounds of ice, that you can explore. You might also recognize Midway from its appearance in the series finale of Everwood, if you're one of the handful of people who watched Everwood. Or if you're Treat Williams. Budweiser took over and transmogrified this little mountain town, the birthplace of The Hills star Heidi Montag, into its booze-fueled "Whatever, USA" back in 2014. 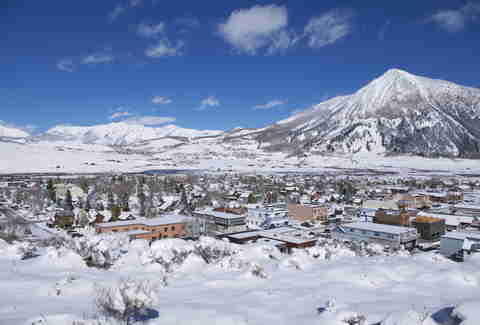 Don't be fooled, though: Crested Butte requires neither beer goggles nor dramatic plastic surgery to amplify its beauty -- all it takes is a fresh coat of powder. Together with the neighboring resort city of Sun Valley, Ketchum sits comfortably in the Wood River Valley beneath Bald Mountain, and as such offers spectacular views of the surrounding countryside that are only amplified in winter.You might also know it as the place where Ernest Hemingway rested his bones (literally, the dude's buried here), but while his house is still standing, the preserve it's located on isn't open to the public.